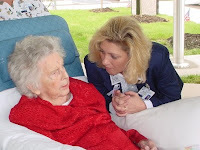 LifeBio is working with senior services agencies and area agencies on aging to provide innovative ways for friendly visitors to build a relationships through reminiscence. Here are 3 tips for getting this program started in your community. 2) Ensure the friendly visitors receive training on interviewing prior to them starting the program in people's homes. 3) Encourage the family and other loved one's to be involved in the process. Knowing more about the person will only improve service and care. To know more is to love more. As people begin with the friendly visiting process, they may think they are already familiar with their clients. What they will learn is the importance of knowing the people, events, and experiences that have profoundly impacted the older person. The older person will most certainly share their values and words of wisdom along the way. The biography process may take a few days or a few weeks depending on the client's preference, but it will certainly be an entertaining and enriching experience for both parties. There are so many health and wellness benefits of reminiscence as well, and reminiscence is an excellent tool for brain fitness too.